Since our first visit in 2012, we have been in love with Green Meadows! 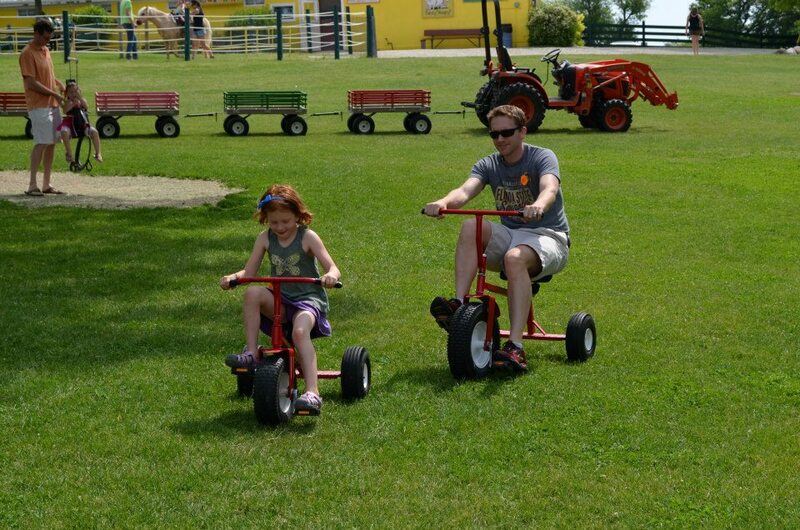 We first bought a Groupon to visit the farm, and we have had season passes for the past two seasons. Honestly, the price scared me off for awhile. People would tell me about this great place, but it’s about 40 minutes away, and $13 per person. When my daughter was 1, it wasn’t worth the drive for us because she hated car rides. By the time we got anywhere, she was so tired out from screaming and crying about being in the car, that we never stayed there long. So it just wouldn’t work for us. But at the end of the summer when she was 2, I decided we could give it a try. And I’m so glad we did! I’m going to show you with pictures why this place is so awesome! This was our first visit in 2012. 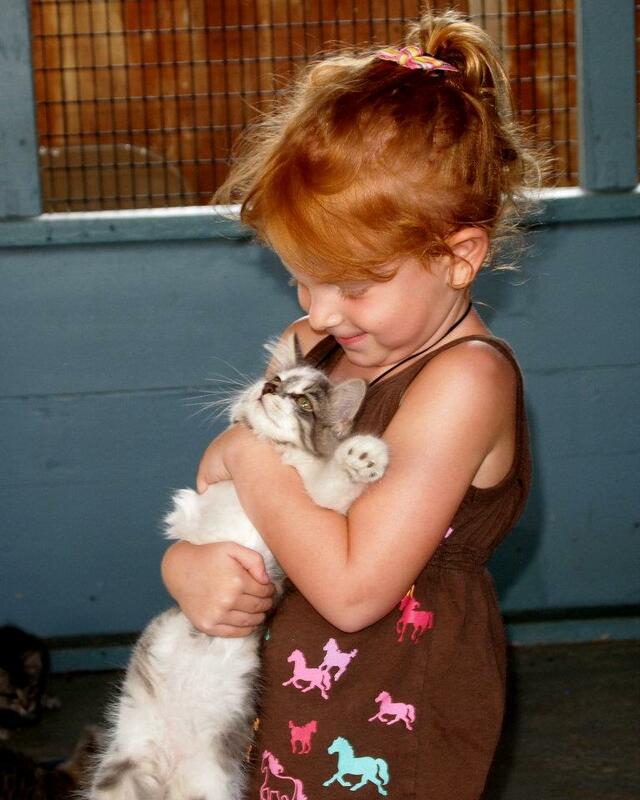 She quickly realized that the kitty barn was the place she loved the most. 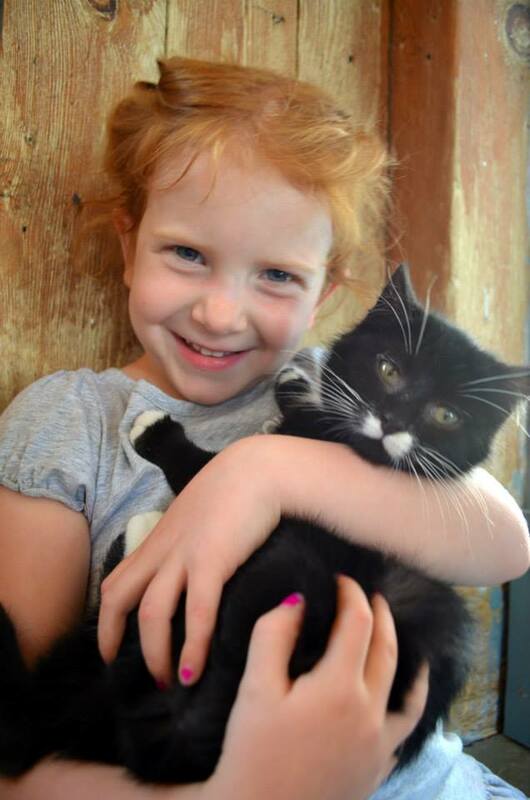 My daughter LOVES cats. But I’m allergic. So the only time she gets to visit with them is if someone has one who’s house we are visiting, or if we go to the “kitty farm” as she calls it. She always has to go to the kitty barn first when we get there. It’s a pretty popular area and it gets busy fast. She’s learned that if she gets there right when it opens, she has some private kitty time before the crowds get there. The kitty’s are so tame! 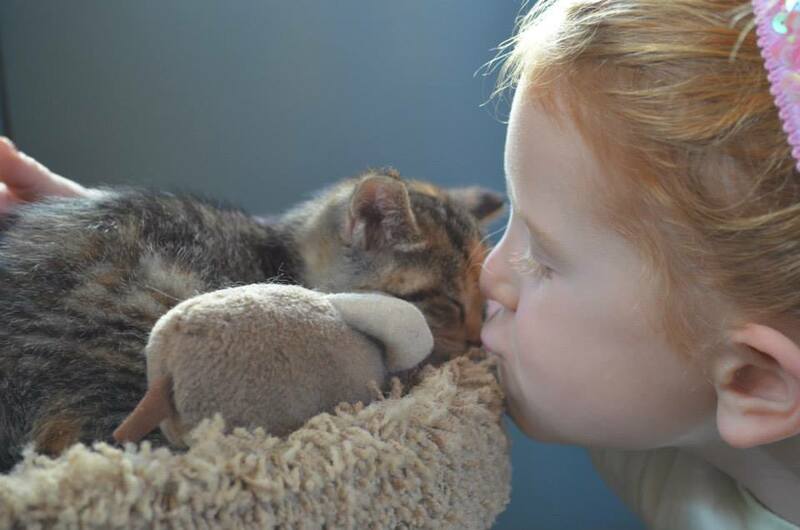 They let the kids pick them up and play with them and even kiss them like this! My daughter has to hold each one and tells us about each of their personalities. Before we go, I always ask her how many kitties she thinks there will be. She usually answers with an insane number, like 130, but then decides 5 is more reasonable. This picture was from 2012, and they’ve moved their small animals into a bigger building. There are chicks, ducks, bunnies, guinea pigs and other small animals. Some can be picked up and some are for petting only. 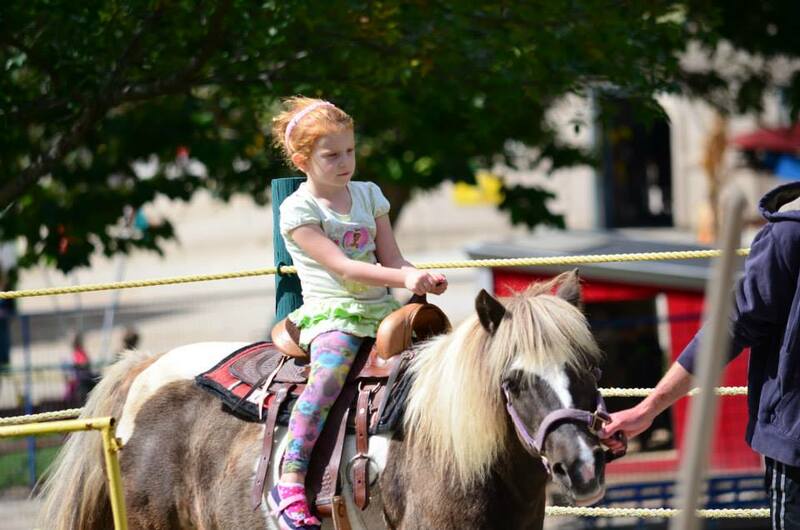 Each child under the age of 12 gets a ticket with admission for a pony ride. It’s a short little ride around, but it’s a nice perk that normally costs extra at other places. It’s included with admission at Green Meadows! Of course there is a goat pen that is FULL of goats! You can feed them, but only from outside the pen. 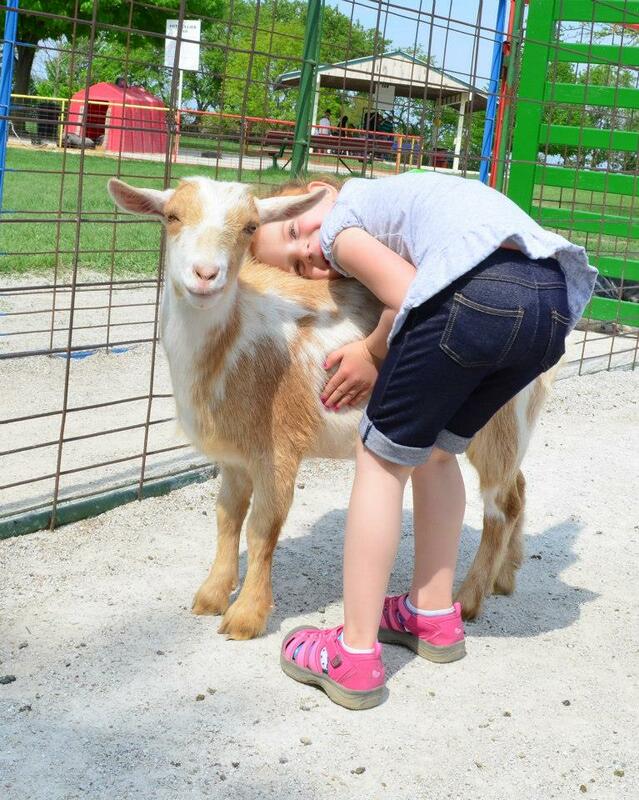 My daughter loves to hug them gently when we go in the pen. If we feed them from outside, she likes to make sure they all get a little bit of the food she has and she will let them know that it’s not their turn, lol! It’s pretty funny to listen to her conversations with goats! There is always a cow ready to be milked at Green Meadows! 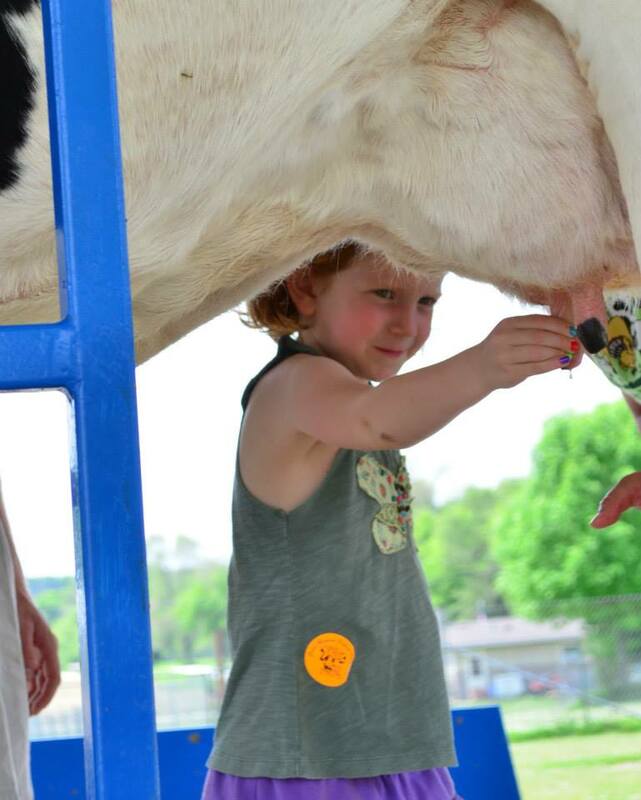 There is an employee there to coach the kids in how to milk a cow, and it’s a great feature. Normally, we learn something new about cows every time we go, because they are very knowledgeable and friendly and like to share their information. 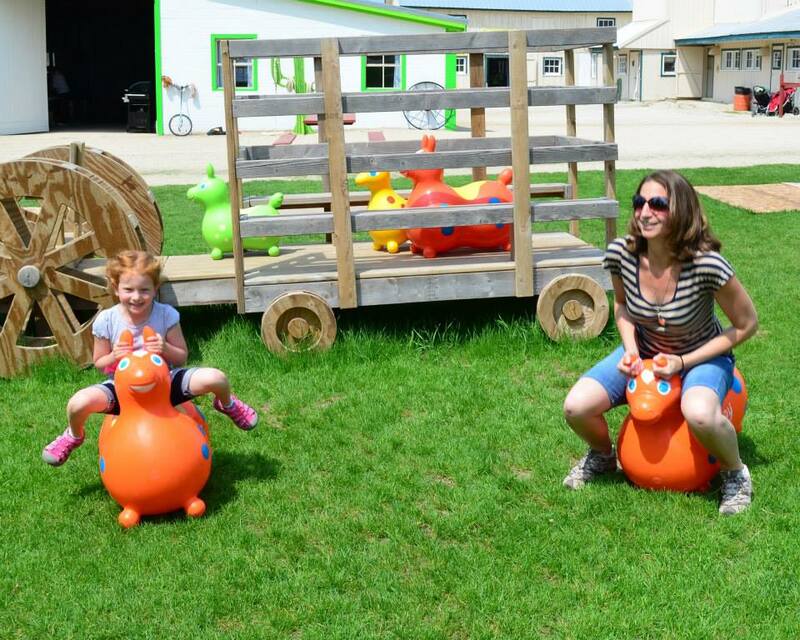 Besides the animals, there are a lot of fun things to do! 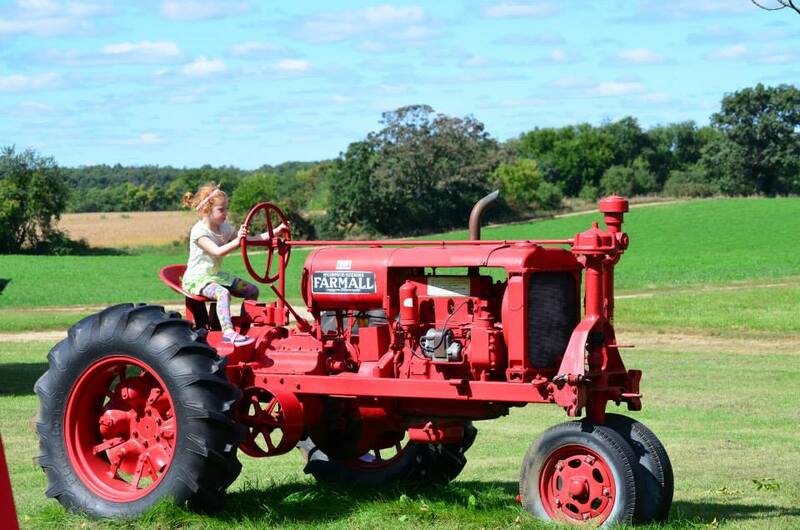 There are tractors like this spaced throughout the farm for kids to climb on and pretend they are driving. These bouncy animals are so much fun! They have small and large ones so adults can play too! 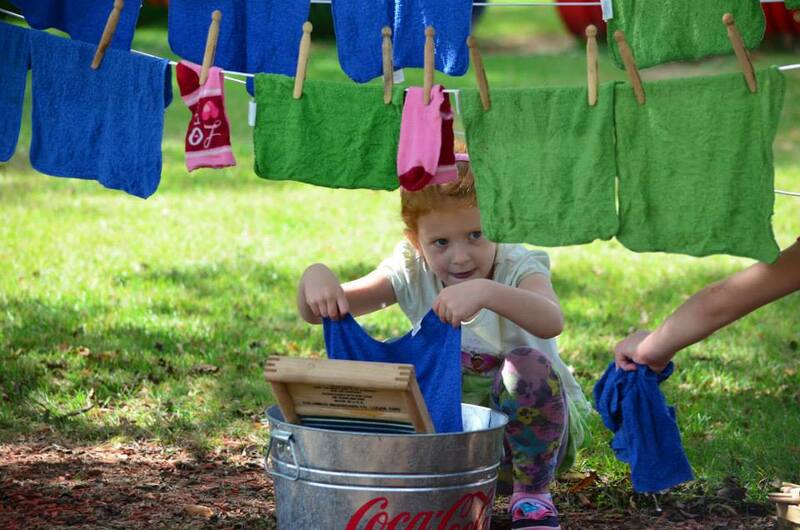 Last fall they had this little station set up so kids could “wash” the clothes and hang them out to dry. My daughter loves activities like this! These tricycles are pretty awesome! They have them in small and large too, and they are big enough for an adult to ride around too! 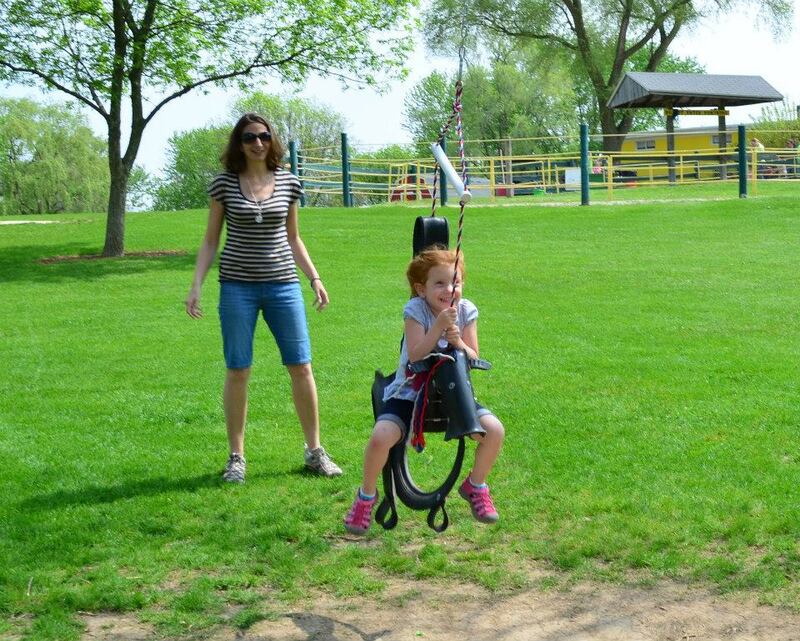 This swing is one of her favorite things! She loves to be pushed super high! 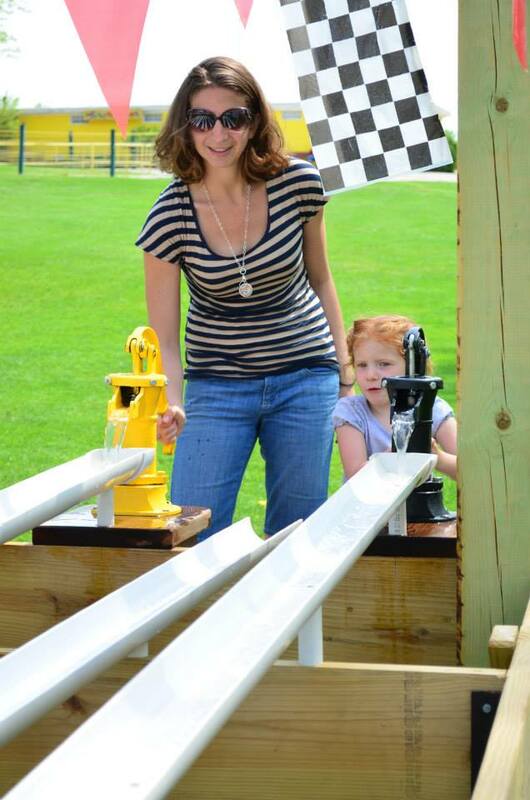 The duck races are another favorite of ours! She likes to line up about 8 ducks at a time and see who can win with that many! 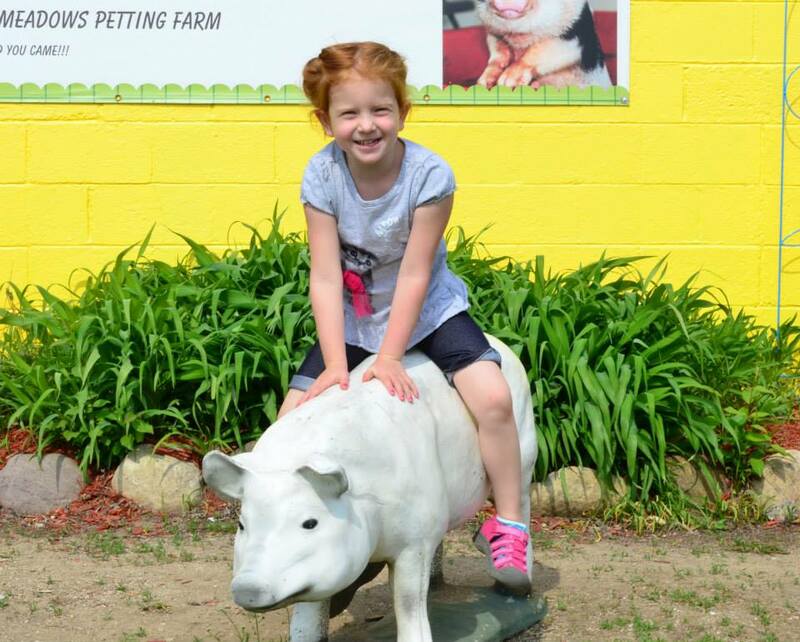 You can’t ride a real pig, so she always has to get on this fake one that’s right outside the entrance. This is such a creative way to set up a slide! And so much more fun for the kids than a ladder! – The people there are so friendly and easy to spot if you have a question- they all wear bright green shirts! – Lot’s of shaded areas for those HOT summer days! I could probably go on and on, but my point is, the place just rocks! 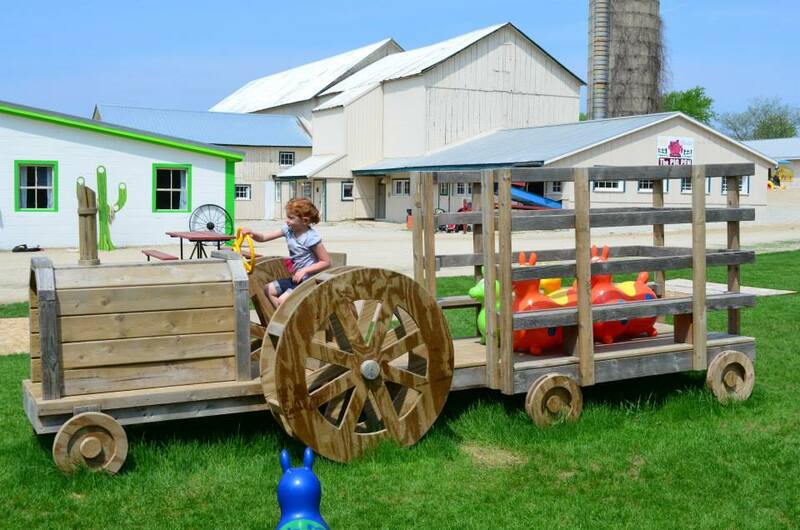 We look forward to when it opens for the season and spend many days visiting the animals and playing on the equipment. 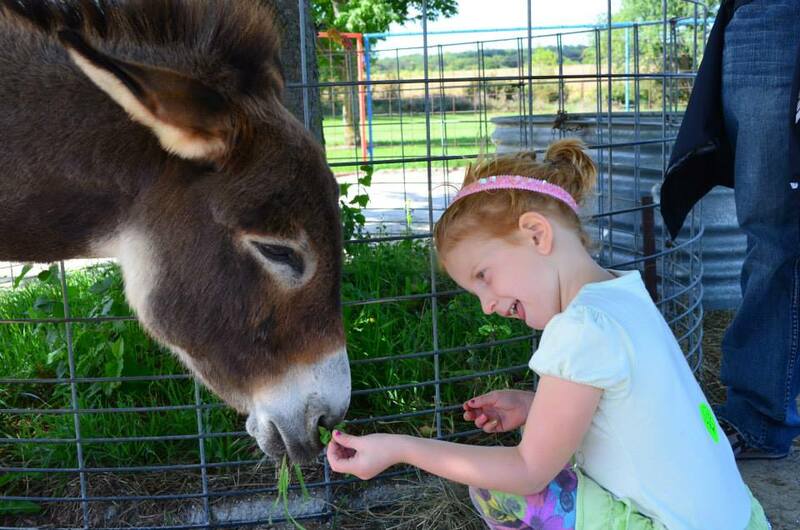 We used to get a yearly pass to the zoo, but since going to Green Meadows, my daughter prefers a place where she can interact more with the animals. 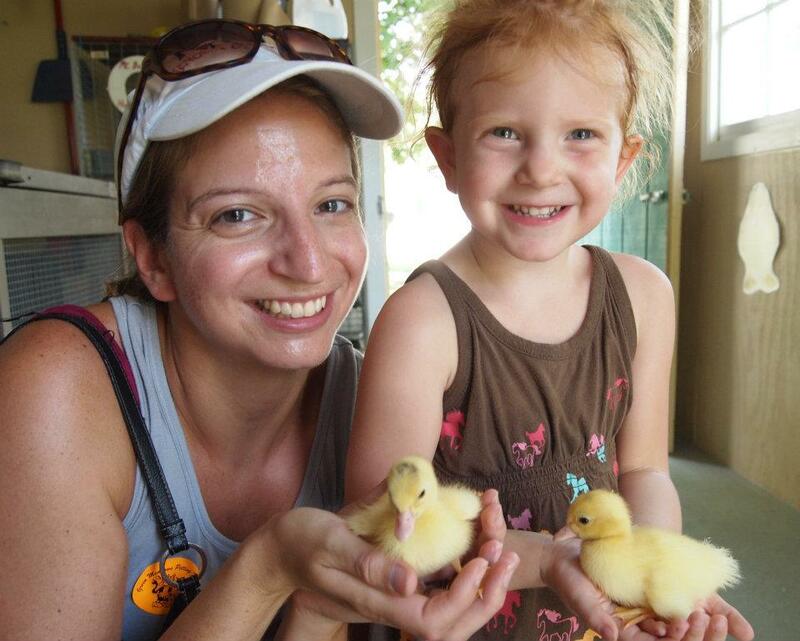 We’ve been to many animal parks, zoos and farms, and the bottom line is that nothing beats Green Meadows! 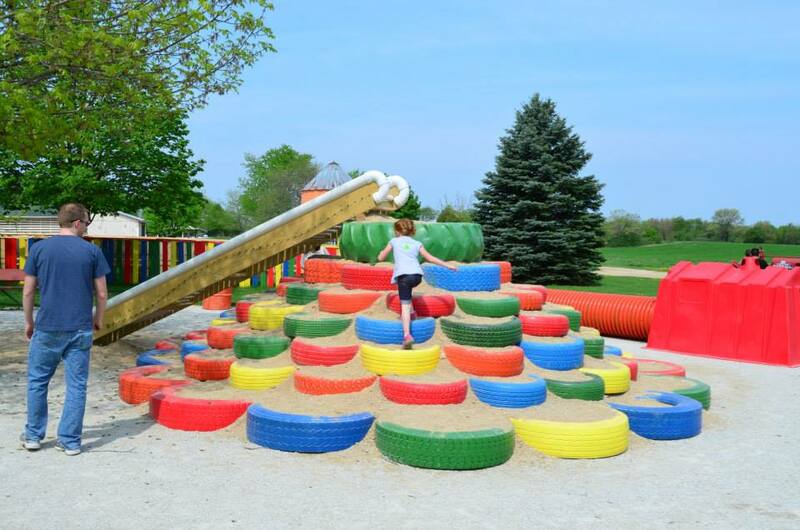 If you are looking for something fun to do in the Troy, WI area, I highly recommend checking out Green Meadows. It is well worth the money and the time it takes to travel there! I was not asked to write this post by anyone, it’s my honest opinion of one of the greatest places to visit in Wisconsin, in my opinion. What is a must-see place near where you live? If you are local, have you been to Green Meadows? You know we love Green Meadows. 🙂 The laundry area is a fun addition. My oldest niece really liked that too. I like that you can walk around with your pony rider if they are nervous or young. Oh! We also really like the hay barn.